Every visualization is an opportunity to tell a story. I don’t always take advantage of that opportunity, opting instead to just “display data” in a simple and user-friendly layout. Granted, sometimes that is what I’m asked to do (business users do love their data tables), but I can say that whenever I approach a visualization as a storyteller, I am more pleased with the results and, candidly, I think the final visualization is always better. And while my storytelling opportunities at work may be limited, there are countless opportunities “in the wild”. MakeoverMonday is one very popular option (which I’ve almost religiously contributed to, although I have missed a few and am planning the requisite penance), but more recently I’ve started contributing to the Viz for Social Good project, a wonderful initiative that connects the data viz community with the non-profit community, harnessing and directing our geeky skills towards some very worthy causes. I’d like to use this blog post to explain how I approached my latest viz for that project, both because a few people have asked about some of the specific design techniques I used and because it might help the future amnesiac me remember what I did (and why). I find that as I age, repetition and reminders are increasingly my friends. Before I could figure out what story I wanted to tell, and then select the right design elements to support that story, I needed to acquaint myself with the contours and key details of the possible narrative. This seems like an obvious step, but I can’t tell you how often I’ve just started building a viz only to get lost in a maze of charts and calculations that may be pretty or technically sophisticated but don’t say anything meaningful. 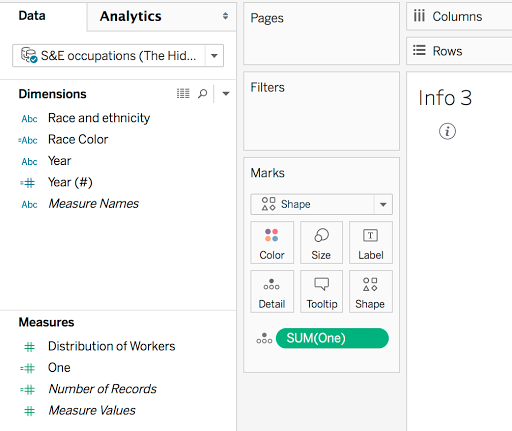 Chloe Tseng, the founder and driving force behind Viz for Social Good, always provides supporting materials for each project, including links to websites, news articles and relevant data sets. 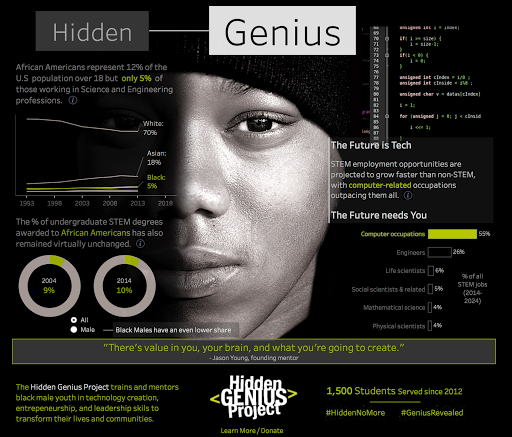 So what were my main takeaways/impressions after perusing the materials she provided for the Hidden Genius Project initiative? The focus of the project is explicitly young black men. The focus of the training is technical, particularly coding. 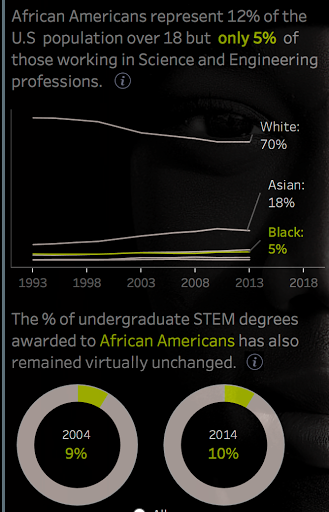 African Americans are underrepresented in tech (both in terms of education and employment) and missing out on the growing opportunities in that field. So, in a sentence: Young black males are missing out on the growing opportunities in tech because they are not receiving the education they need to participate. There were other possible stories to tell (e.g. the history of the Hidden Genius project, the structure of its programs, the number of students who have participated, individual success stories, etc), but the three items listed above are what resonated with me and what I wanted to focus on. I also felt that the project’s website already did a great job telling some of those other stories, so linking to it (vs. replicating it) felt like a more fruitful approach. That said, I’ve seen a few amazing vizzes that focused on some of those other elements (see here and here), but I suspect I wouldn’t have done as good of a job had I taken that approach since that isn’t where my inner storyteller wanted to go. Once I had the story I wanted to tell, the central design element came to me pretty quickly. I wanted to have a photo of a young African American man dominate the viz, with half of his face obscured. 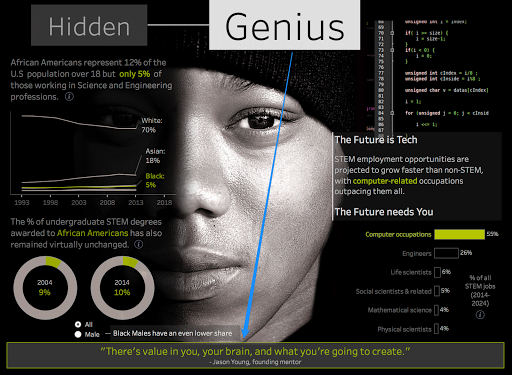 To me, this image conveyed the central theme of the story, namely that young black men were both overlooked and under-represented in the technology field. I also felt that a large photo would have a more visceral impact and (hopefully) draw people in more than a number of charts would. There would be charts too, but I wanted them to play a supporting role. It needed to be available for me to use, i.e. not have restricted usage rights. I didn’t always pay attention to this when I created visualizations, but I now know to make sure any image I use has been shared by the photographer in a way that allows me to use it without violating copyright. Many photos are shared under Creative Commons, so the available pool is still pretty big, but it is both prudent and respectful to make sure any image you use is one you should use. An easy way to check is to use the Google Image search tools and only select images that are labeled for re-use. Some sites (like Flickr, where I ended up finding the photo I used) also allow you to see the usage rights for an image. Clicking the “Some rights reserved” will tell you exactly what you can and cannot do with the image. I wanted it to be monochrome and have no background. I know that you can desaturate any color photo and remove backgrounds, but those post-production steps don’t always produce the best results, so I was looking for a photo that I could use as-is. I wanted a photo that would look good big. Some photos shared online are available only in smaller sizes that get very pixelated when you enlarge them. I eventually found the perfect photo and went about obscuring one half of the young man’s face. There are a number of ways to do this. Pooja Gahndi (who inspired me to use semi-transparent images in my vizzes) uses MS Word, but since I have a Mac without MS Office, I do my photo prep in the free software GIMP. 3. Lower the opacity of the bottom layer. This may require some trial and error to get to the right amount. Since I wanted to still see a little of his face, I set the opacity to 15 (or 14.9 in the uber-precise Gimpian universe). 4. 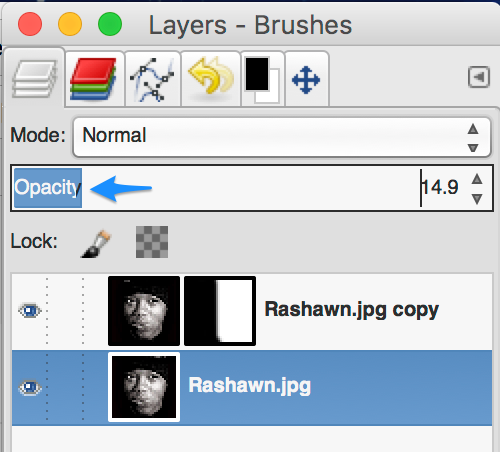 Add a layer mask to the top layer, initializing it to “White” (or full opacity). 5. Use the paintbrush tool to color in half of the layer mask with black. What painting with black does is obscure any part of the image that you paint over, allowing anything underneath to show through. 6. Save the image as a .png file, as that will maintain the transparency. 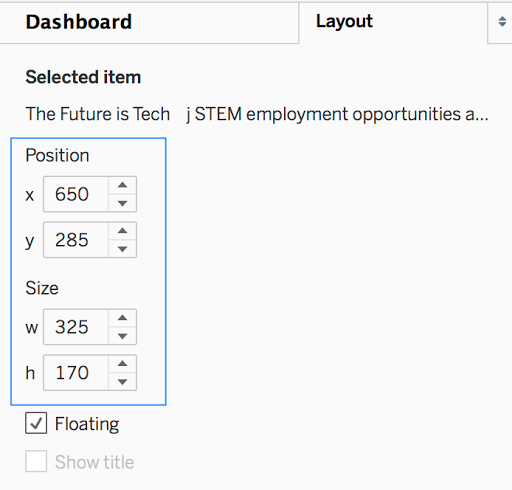 Once you have the semi-transparent image file, simply open it inside of Tableau by dragging an Image object on a dashboard tab and selecting the file you just saved. In my case, I also set the dashboard background to black so that the image blended in the way I wanted it to. I wanted to let the Hidden Genius logo drive the color palette. As such, I decided to only use monochrome colors (i.e. gradients of black, white and grey) and the specific shade of green used in the logo (which I sampled via the color picker tool in Tableau and added as a custom palette). 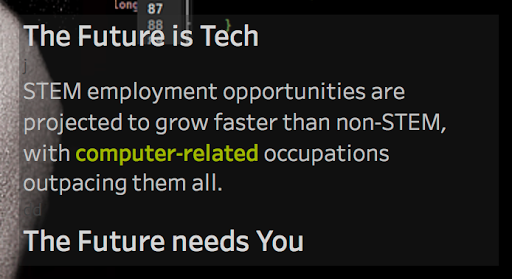 In particular, I wanted to use the green as an accent color to identify the focus areas of the story, which were African American men and the Tech field (specifically coding/computers). 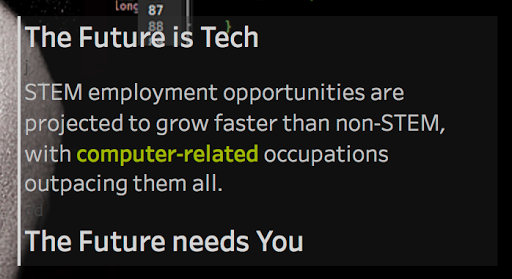 So, in each of the charts and text boxes, I only used that green to format elements that related to either African Americans or the computer industry. Now that I had my central image and overall color palette, it was time to start adding the other elements to my dashboard. This is where floating and floating order become indispensable design tools, since they allow you to have precise control over layout and how the different elements on your dashboard interact. I wanted to divide my canvas based on the split nature of the photo. 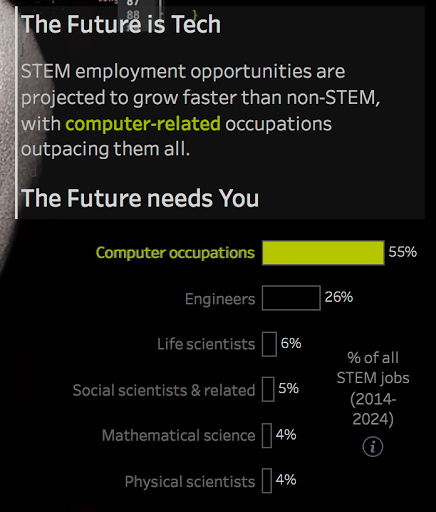 The left side would highlight the “Hidden” nature of African Americans in STEM fields (both in terms of employment and education), and the right side would focus on the opportunity available to the untapped potential of this target demographic. So, first came the title, which is just two text boxes floated on top of the photo. Their placement and formatting are very deliberate. I chose to make the “Hidden” text box smaller than the “Genius” text box (80 pixels high vs. 100) and used more subdued colors to shift the visual emphasis to the right. I used a skinny text box (height of 1-2 pixels) to connect the two text boxes, which helps underscore that this project guides the young men from obscurity to visible success. 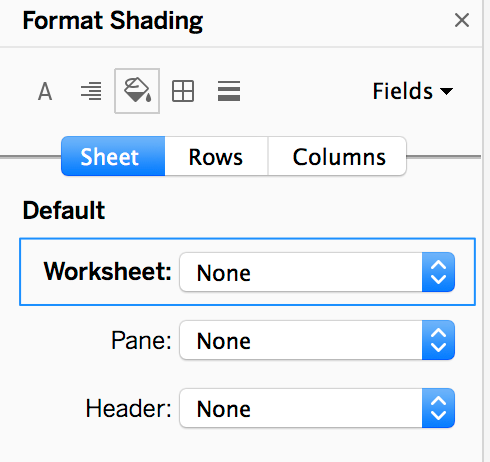 I set the Worksheet shading to ‘None’ so that they inherited the background color from the dashboard (i.e. black). I made sure the worksheets were lower in floating order than the photo. You can do this by selecting and dragging the objects where you want them on the Layout panel. This is the way you make it appear that the sheet background is transparent. In actuality, the photo is just on top of the sheet, but since you’ve set the opacity of the photo very low, it doesn’t obscure the chart. I positioned the line chart so that the young man’s right eye could still be seen. The right side followed a similar approach, only I didn’t need to worry about floating order as much since I didn’t want any of the elements (the snippet of code, the bar chart) to be on top of the young man’s face. I just nudged things around the canvas until my OCD was satisfied. This mostly involved using the Position and Size settings in the Layout pane to ensure each element was where I wanted it to be. Sometimes I like to place borders around my text boxes, and sometimes I don’t. Sometimes, though, I only want a border on one side of a text box, as a way of providing a little separation between the text box and the background without being too “heavy”. To do this I can’t use the standard formatting options, since it’s all or nothing when it comes to borders (i.e. all four sides or no sides). In these cases, you can use another text box (with a width of 1-2 pixels) and simply place it alongside the edge of the other text box. And finally, since there were a number of data sources used for this viz, I wanted an easy way for the viewer to see where the data came from (and maybe get a little more contextual information) without having to go to another tab or reference a single info pop-up in one corner of the viz. So instead I created a few info sheets and placed them directly next to the specific data I wanted sourced. Each info sheet contains a single measure (I created a measure called ‘One’ which is just the number 1) with a Mark Type of Shape. For the shape I used an information icon downloaded from Google. Read this post in case you don’t know how to add custom shapes to Tableau. It’s very easy. I set each sheet to have a width and height of 20 pixels and placed them onto the dashboard canvas. I then added the necessary reference information to each sheet’s tool tip. Since I wanted people to be able to hover over these sheets and read the information in the tool-tip, I made sure that these info sheets were higher in the floating order than the main image. Each viewer will ultimately decide whether all of these design choices aided the visualization. Was the story clear? Was it compelling? Did I make it easy for them to engage with the data? I certainly hope so. But I will know that I did my best job when I can clearly articulate why each element was added to the visualization and what purpose it served in telling the story I wanted to tell. And by being able to do that, I believe I increase my chances of connecting with my audience and making a successful visualization.